On Saturday, October 14, I joined a group of seven volunteers, who braved the cold and wind to help clean the shorelines of the Nature Conservancy of Canada's (NCC’s) Percival River Nature Preserve. Percival River, which feeds into Egmont Bay, provides Islanders with a view rarely seen on Prince Edward Island: forest all around you. The area evaded being plowed for farmland due to its marshes and boggy ground, making Percival River the perfect area for wildlife to thrive. Unfortunately for us, it also made for a pretty messy day trekking through the mud. Luckily nobody lost a boot! Despite all of this, NCC volunteers and staff were in high spirits and made very quick work of the cleanup. For the first hour of the event, two of the volunteers helped Julie Vasseur, NCC’s PEI program director, conduct a bird survey while the rest of the group focused on cleaning the shoreline. Because of the high winds there weren’t many birds around, although the group did manage to see six Caspian terns catching fish for lunch in the bay. After only three hours, the entire shoreline was clean and volunteers even continued to clean up around the dock where local oyster fishermen launch their boats. 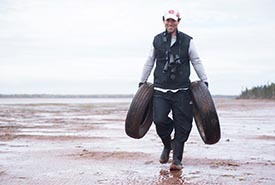 Volunteers picked up an incredible 2,300 pounds of garbage from the shores, including 28 tires, hundreds of buoys pieces, rope and netting, plastic water bottles, and much more. As a bragging rights incentive, volunteers were challenged to find the weirdest piece of trash they could. This turned out to be a rubber toy pig. I was blown away by the passion, hard work and sheer determination of this small group of volunteers. At NCC, we are so grateful for all of the hard work that our Conservation Volunteers put into restoring our nature reserves and important natural spaces. NCC couldn’t do the work we do without their help. Although our Conservation Volunteers program has wrapped up for the season, keep it in mind for next summer — it’s a great way to enjoy the outdoors and give back. To find future Conservation Volunteers events, visit our website at conservationvolunteers.ca.